Ahn Cheol-soo, cochief of the minority opposition People’s Party and lawmaker-elect of the incoming National Assembly, on Sunday alluded to his candidacy in next year’s presidential election. “As stated in our party platform, a party leader who is to challenge the presidential race should resign from the post at least a year ahead of the election,” said Ahn during his postelection visit to the nation’s southwestern city of Gwangju. It was in this city and the surrounding Jeolla provinces -- the longtime opposition stronghold cluster referred to as the “Honam” region -- that the nascent centrist party recorded a sweeping victory, claiming 23 of the 28 local constituencies. Ahn’s comments came during a luncheon with the party’s local headquarters officials and the political department chiefs of local media. He had been asked about his blueprint on presidential candidacy. “Now is the time to show to the people how the People’s Party may take a leading role in creating a productive parliament,” he said, sidestepping the question. He also remained vague on whether or not he will seek for a consecutive term as party chief by participating in the party’s national convention slated for July. “Our goal is to create a party which may change existing politics, people’s lives and the current government,” he said. But by reiterating the party platform, he effectively displayed his implicit plan to refrain from party chairmanship and warm up for the presidential race. The former computer vaccine developer, who stepped into political circles as a potential candidate for the 2011 Seoul mayoral by-election, rose to the national spotlight by running in the 2012 presidential race as an independent candidate. Following months of brawling over opposition unity, Ahn renounced his candidacy, giving way to main opposition candidate Moon Jae-in, who then lost to eventual president Park Geun-Hye. But this time, a merger or strategic alliance within the opposition camp is not much likely to happen, according to Ahn. “It would be inappropriate to speak of political realigning at this point in time,” he said, displaying his disapproval over a possible union with The Minjoo Party of Korea. Ahn also refuted criticism that his party’s political leverage was limited to the Honam region. “Having some two months to prepare for the election, we did not have sufficient time to discover competent candidates, but things will be completely different from now on,” he said. 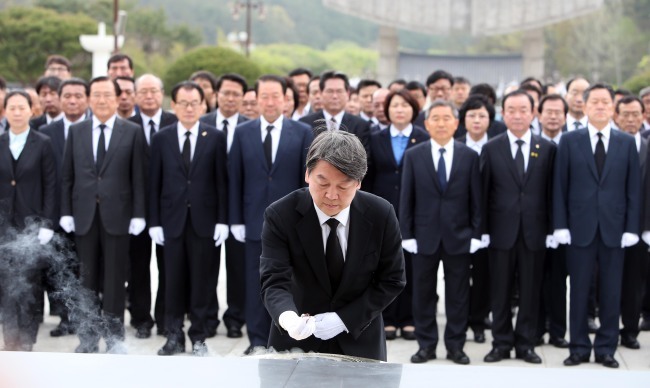 The party’s leadership, along with 13 lawmakers-elect of the Honam region, paid their respects at the May 18 Memorial Cemetery, which honors the victims of the 1980 democratization movement.